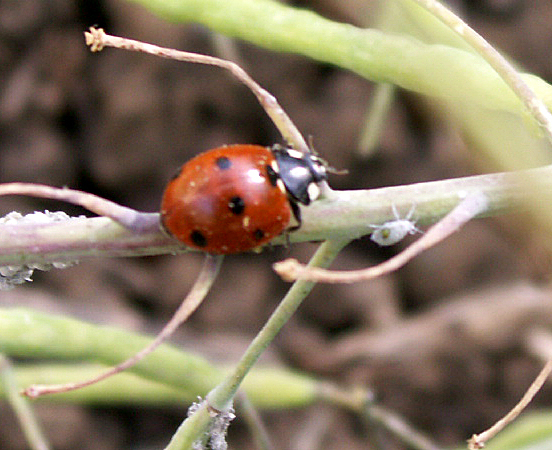 While planting summer crops this morning I noticed a ladybug on one of the kale plants I’m letting go to seed. It has aphids on it so I was curious if the ladybug would be eating any of the aphids. Check it out! In picture one, the chase is on. 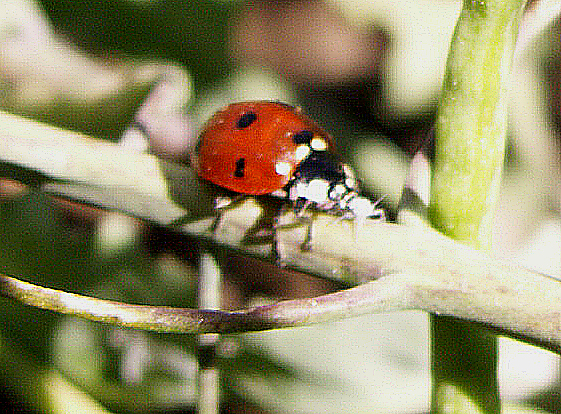 In picture two, it looks like the ladybug has caught the aphid and is sucking out its juices, thereby killing it. This is how things seem to work. I don’t worry about the aphids, frankly. They usually are on a plant only for a few weeks and not on all my plants. I just let them go, on the theory that if they are there in a large enough population they will attract predators that will go after them. I certainly don’t use pesticides, since I don’t want to kill off the good bugs.